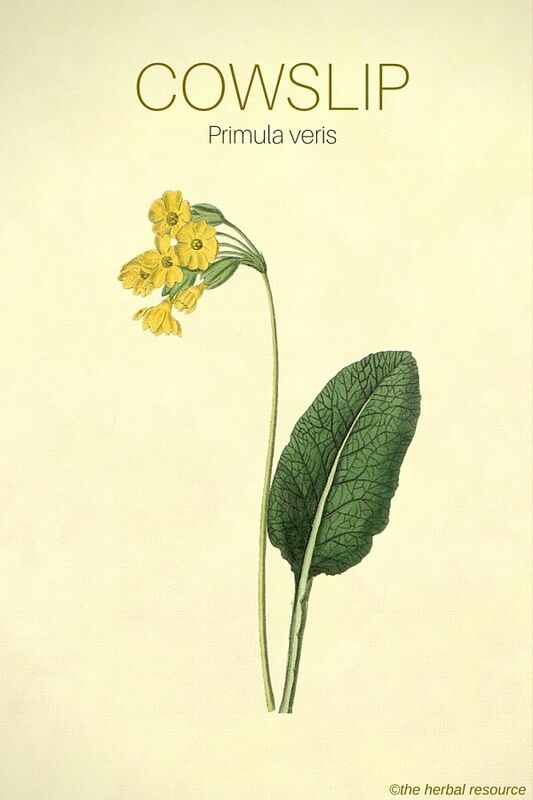 Botanical Name: Primula veris, Primula officinalis. Other Common Names: Cowslip primrose, key flower, key of heaven, palsywort, fairy cups, primrose. 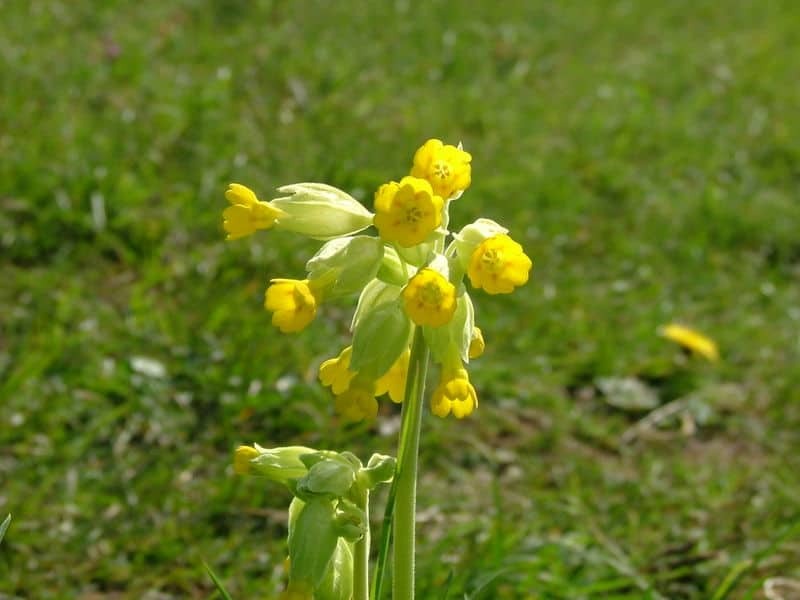 Habitat: Cowslip is common throughout temperate Europe and Asia. It is tolerant to frost but is less common in northern latitudes. It grows well in shady areas and places with full direct sunlight, as long as the soil is sufficiently moist. Plant Description: It is a low-growing perennial with a 5-15 cm rosette of leaves. Flowers bloom in a cluster atop a single stalk which may reach as tall as 20 cm. Cowslip is found more frequently on open ground, and its seeds are often part of the offerings in commercial bird seed. Blooms are sweet-smelling and yellow in color, marked with orange dots. It is generally one of the first flowers to bloom in spring. Plant Parts Used:: Flowers, leaves, root. William Shakespeare was so taken by the beauty and benefit of cowslip that he immortalized it no less than 8 times throughout his plays. In the 17th century, the famous English botanist Nicholas Culpepper asserted that anyone who used the distilled water from cowslip, or an ointment made from its flower, would become more beautiful. Modern herbalists still make a skin cleaning lotion from cowslip. It is said to be useful in treating acne, pimples, and other skin blemishes. Its unique cleansing properties are said to remove dirt and open the pores of the skin, allowing for a fresher, smoother look. It has been used for centuries to make sedative tea. Its leaves are said to be mildly narcotic, and it is used as an herbal remedy for insomnia as well as hyperactivity. In Europe, it has been an effective calming beverage for problems related to nerves and anxiety for many generations. The flowers are thought to be a milder sedative and are used to calm children and help them sleep. The cowslip roots are expectorant, and can be used to treat common cold and flu-like symptoms. They are widely held to break up mucus so that it can be more easily expelled by the body. Cowslip has been used in folk remedies to reduce blood clotting and is sometimes used as an antirheumatic. In Europe, it is widely used for whooping-cough, and its effectiveness as an expectorant has been widely documented throughout modern history. Current research is looking into the usefulness of the plant in treating asthma and allergies. The plant’s antispasmodic properties could make it useful in treating epilepsy, tremors, and may even be developed as a treatment for Parkinson’s Disease. Though rare now, a maceration of the cowslip flowers was once a common poultice applied to bruises and was thought to draw out the damage and speed healing of the skin. This herb has often been used as an herbal alternative in treating kidney complaints and urinary tract infections. When prepared as a tea or infusion, the patient should drink one cup 3 times per day, roughly corresponding to mealtimes. A 2-4 ml dose of tincture may also be used three times daily. As an ointment or cream, the herb may be applied as needed, but usually no more than 2-3 times per day. 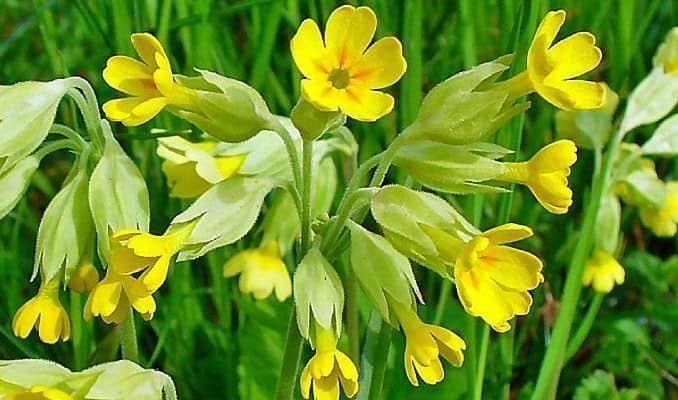 Cowslip should not be used by pregnant women, or persons who are using anticoagulative medications because the same properties are present in cowslip and the cumulative result could be unpleasant. There have been rare cases of people who are allergic to the stamen of the plant, but the condition is not severe and can be easily treated. The woman who makes my tinctures recommends cowslip for pain management. I do not see that mentioned here in your listing of “Therapeutic Uses, Benefits and Claims of Cowslip”. Have you any information on this use of cowslip? It does seem to have pain management properties as I have used it as such and have had positive results. Cowslip has been used traditionally for nerve pain. I could not find any scientific studies that can confirm the herb’s uses for pain management.